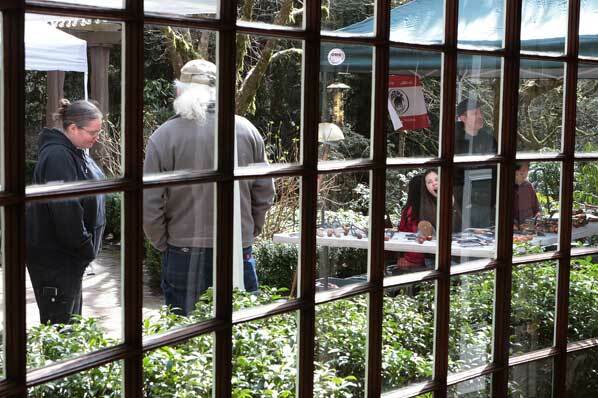 Outside the Leach Botanical Garden’s Manor House in outer East Portland, their first Spring Garden Fair is underway. 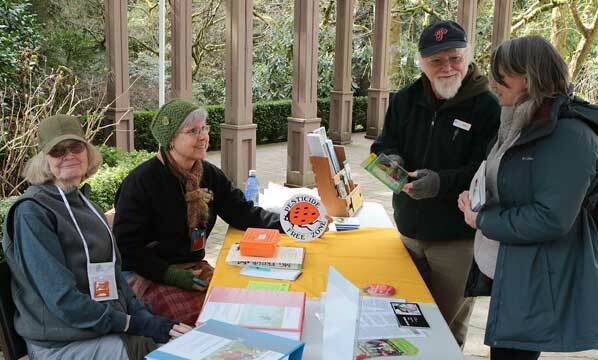 The chilly afternoon didn’t keep many folks from enjoying Leach Botanical Garden on March 16, as it hosted the first-ever Spring Garden Fair. “We were brainstorming with our Garden Curator, Courtney Ventarick, about programming – and she suggested we present a springtime garden fair here,” explained Leach Garden Friends Education Coordinator JoAnn Vrilakas at the event. 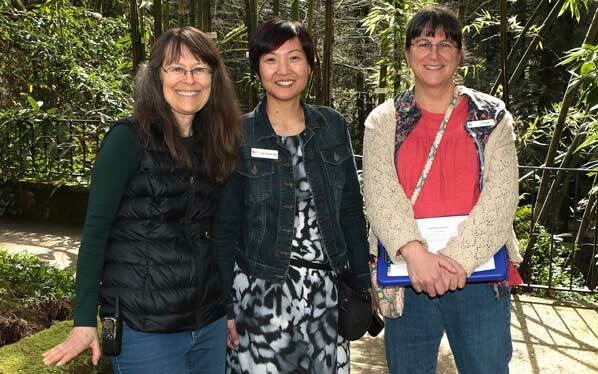 Pleased with the response to the new fair are these organizers – Leach Garden Friends Volunteer Coordinator Annie Winn, Event Coordinator Jo Shintani, and Education Coordinator JoAnn Vrilakas. 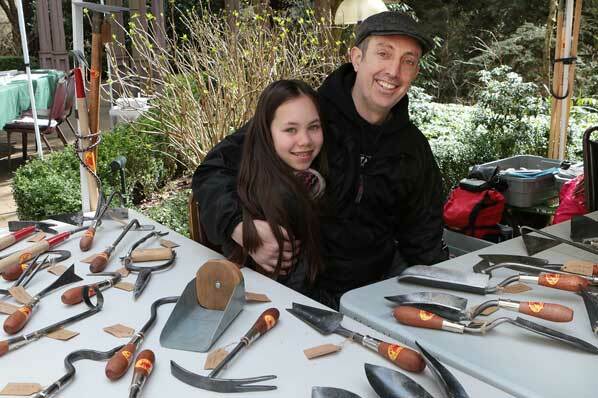 Domini Pauley and Seth Pauley of Red Pig Garden Tools offer implements “crafted the old fashioned way, by hand”. OSU Extension Service Master Gardeners Judy Spreadborough and Rhonda Frick-Wrigte chat with fairgoers Thom Corcoran and Katie Robinson. The next big event on their calendar is the annual plant sale on Saturday, April 13, Vrilakas pointed out. 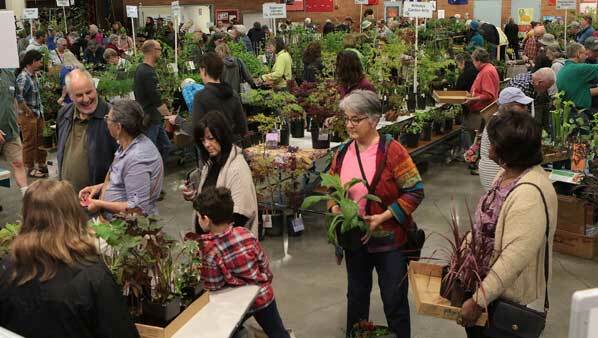 From 9:00 a.m. until 2:00 p.m., shop from among thousands of plants and starts. You’ll find plants, both blooming and not, provided by local nurseries, plus many from the Leach Garden collection! Bring your pocketbook, get great plants, and help support the nonprofit Leach Garden Friends group. It’s at Floyd Light Middle School, 10800 SE Washington Street, 97216. For more information, call 503-823-9503.